JAMB has urged all applicants, both Unified Tertiary Matriculation Examination (UTME) and Direct Entry candidates to re upload waec result on JAMB Portal (WAEC, NECO, NABTEB etc) for 2019/2018 academic session admission exercise. Direct Entry and Jamb Re upload Requirement. 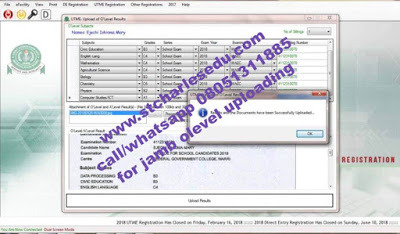 How to Re Upload WAEC O’Level Result On Jamb Portal 2019. How to Recover Lost Jamb or Direct Entry Profile Code to be used for Jamb Re Uploading. 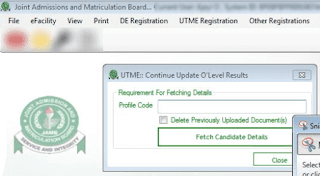 Jamb Re Upload WAEC Result: How to Retrieve Profile code through Direct login. How to Re Upload WAEC Result For Jamb Candidate. How to Re Upload WAEC Result For Direct Entry Candidate. Many online post will tell you, you can re upload your o’level result by loging into jamb portal which is false, as jamb has not yet enable such function specifical for candidate. The only way you can re upload your o’level, result is to visit jamb accredited cbt centre. 1. Visit any accredited JAMB CBT Centre or JAMB office or JAMB Registration centre nearest to you. 2. Provide them with a copy of your Olevel Result and jamb profile Code. 3.The cbt owner operator will launch the jamb admission and matriculation board software. 5. Then Select Upload O’level Results. Please Note. There is no thumb printing in uploading of your o’level result on Jamb Portal. How to Create Jamb Profile that Work. Can I be able to upload My WAEC or NECO result to Jamb Portal using my Mobile Phone. Currently this function is not enable, you can not used either your phone or a desktop to upload your Olevel result to Jamb Site, you have to visit cbt Center nearest to you to do so. Reach us on mobile/whatsapp 08051311885, if you are interested we upload your Olevel result to Jamb Website. Below are the detail we need from you. After Successful Uploading Your O’level Result to Jamb site, below is a sample of a confirmation screen shot we are going to send to you, that carry your O’level and jamb details. Reach us on mobile/whatsapp 08051311885 for price negotiation. is jamb uploading of waec or neco result compulsory? Yes it is Compulsory, as it is one of the Requirement to Gain Admission. The Deadline Line or Closing Date to upload results to JAMB Portal is set by the school a candidate has applied to. we advice candidate to immediately upload their awaiting result once it is released online. There is no specific deadline for re uploading of the O’Level results to JAMB portal. The Closing Date or Deadline to upload results to JAMB Portal is determine by the school a candidate has applied to. Is jamb re uploading of NECO or WAEC result for everybody. Recently Jamb came up with a new policy, this policy is to ensure that no student is cheated of his/her right in gaining admission into the higher institution of their choice. Hence they made it compulsory for all JAMB candidates to upload their O’LEVEL/SSCE/NECO/WAEC result on jamb portal. JAMB Re Uploading of NECO or WAEC Result Deadline. (University/Polytechnic), so we encourage you do it before the admission list comes out. In conclusion do not wait for your Institution to give deadline/closing date before you upload your olevel result. Can someone who has used a result during registration replace the result with another one? Yes, it is possible. the previous result detail will be deleted upon login. can i upload old result even after i used awaiting results in jamb? To recover your Direct Entry or Jamb Profile code, what you need to do, is to type and send “RESEND” in SMS format to the jamb short code “55019” with the GSM number you used during profile registration. 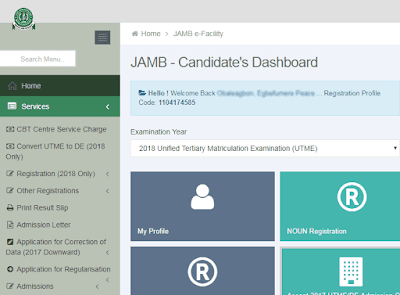 Why Login To JAMB or Direct Entry Profile? A lot of information concerning applicant registration details and Exam details can be accessed when candidates login to their JAMB or Direct Entry Profile. Checking And Printing of Jamb Examination Result Slip. Checking And Accepting of Admission Offer on Caps. Checking And Printing of Admission Letter. Click on “Login” and you will be redirected to your Profile dashboard, where you can retrieve your profile code. I don’t see upload result on my profile either. What do I do? there is no option like upload o’level result on my profile, what should i do? Sir,pls,i already have my 2017 O’Level Results but dey filled AR into d space 4 d results during my 2018 jamb registration.I av gone to a cyber cafe to upload my O’Level Results and they did it but i didnt see any documents uploaded on my jamb profile.Pls,help me sir. PLEASE,MY JAMB PROFILE ISN’T SHOWING A PLATFORM TO UPLOAD MY WAEC RESULT TO MY JAMB. WHAT DO I DO? you can as well reach me on the phone number on this post on how i can help you. sir between my Neco and my Weac i don’t know which one will be good but I put weac as awaiting results when i filled in screening form, if the Weac is not good, can i still change it to Neco? Sir, i have uploaded my waec result. But, if i want to change it to neco, will i able to change it? what if d email i used for jamb is nt valid anymre hw will u upload result nd get ur jamb original result??? 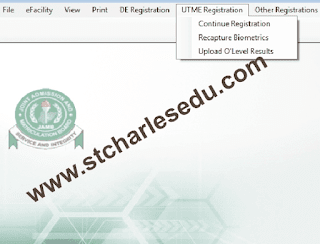 Uploading of Olevel result does not make use of email address, instead, what they need is your utme profile code. for the printing out of jamb original result. you need just the email address.you used to sign up for jamb. sir them make mistake in my jamb them didn’t upload my result, can I still upload it?? plz av done d re-upload buh don’t know how 2 check if it was successful or not, although, d attendant at d cbt center told me it was successful, he even showed me n I saw it on d screen buh I want 2 confirm it on my profile myself but don’t know how to. When I uploaded there was no message sent to my phone. Why? This previlage of uploading of olevel result into jamb portal is only accessable to cbt owner, get in touch with any. Pls I uploaded the wrong grade of my O level result on jamb portal…what can I do? Can i re upload my olevel results in a cyber cafe instead of a cbt centre? Evening, I paid at a cafe that works with jamb to reupload my waec result so I wasn't there. Is there any other way for me to confirm if it has been reuploaded? Can i change my uploaded o'level result now again.